Fair Isle Bird Observatory: the Warden's diary: Spring birding in Style. Whilst the 28th saw a similar spread of birds around, it was livened up by a Honey Buzzard found by visiting ex-Warden Paul Harvey, although unfortunately it was only seen for a short time as it left Malcolm’s Head and headed north-west. The question of whether I can count the raptor shaped dot I saw from Chalet as it circled high away from Hoini as Honey Buzzard on my Fair Isle list is maybe best left to me and my conscience. Amongst all the raptors of recent days, the only one I manged to see (properly at least) were the Peregrines. 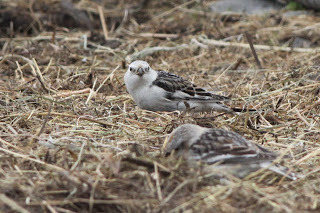 The chicks on the west coast are doing well (where a SNH supported Ranger-led walk showed the nest to interested visitors and islanders this week) and the adults are regularly seen around the island. The pleasant weather continued to the 29th (although a slightly fresher northerly breeze picked up) and an increase in migrants brought several more highlights and some excellent all-round birding, with lots of happy faces in the bar at Log (and a few welcome 'clinks' heard from a rapidly filling Tick Tin!). Chief amongst these were the two Thrush Nightingales found in the early afternoon only a few hundred yards away from each other at Haa and Utra. 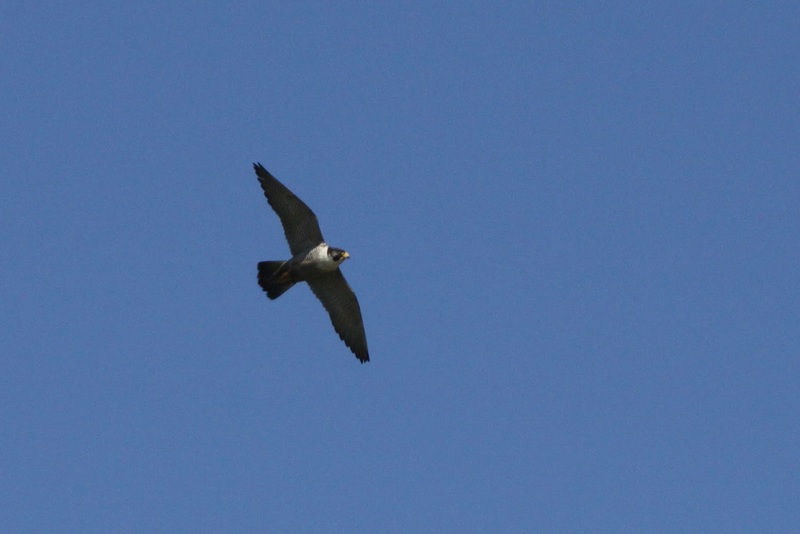 Also up there in the bird of the day stakes were a Hobby (the first since 2011) seen briefly as it whizzed overhead and our first Common Rosefinch of the year at various gardens in the south. The latter species did rather open its account for the year in style with the bird in question being a fine red male, which was singing at Schoolton later in the day. Adding to the raptor theme was an Osprey (and a new Sparrowhawk), whilst an Icterine Warbler was also new (and also singing at Schoolton). A small arrival of warblers had obviously taken place and, as well as the lingering Blyth’s Reed Warbler there was (finally) our first Reed Warbler of the year and counts of 3 Marsh Warbler, 9 Whitethroat, 8 Garden Warbler, 7 Willow Warbler and 6 Lesser Whitethroat. Other scarce migrants included 6 Red-backed Shrikes (the same number as on 28th, although how many birds have passed through in three weeks of almost daily sightings is unclear), 2 Bluethroats and Grey-headed Wagtail (with 2 on 28th), whilst other species of note included Cuckoo, Short-eared Owl, 3 Redwing, 10 Spotted Flycatcher, 5 Redstart, Whinchat, 2 Pied Flycatcher, 2 Tree Sparrows (still) and 11 Snow Bunting, whilst Water Rail and Green Sandpiper were also noted. 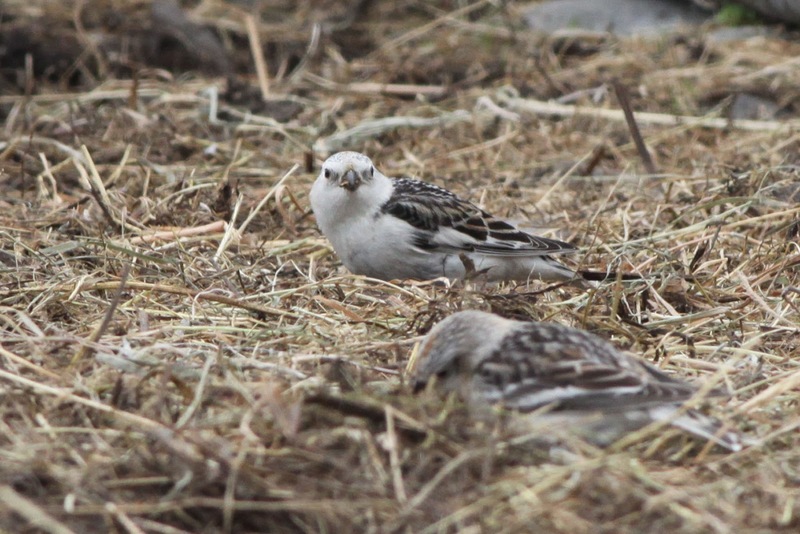 An unusual late-spring influx of Snow Buntings has also been noted elsewhere in the Northern Isles. These two were at Kenaby today. The 30th started fairly brightly, but fog set in thickly later and little new was noted, although Blyth’s Reed Warbler, 2 Marsh Warblers, 4 Red-backed Shrikes (one of which was seen coming in off the sea at South Harbour) and a Grey-headed Wagtail were still present. A potentially murky couple of days combined with a light westerly wind will not encourage any big falls (but might not stop a big rarity), but lighter SW winds, followed by a day or two of easterlies early next week could prove interesting. I’m sure this spring isn’t finished yet. Although Kittiwakes finally started nest building yesterday, the season is shaping up to be a poor one for the breeding seabirds. 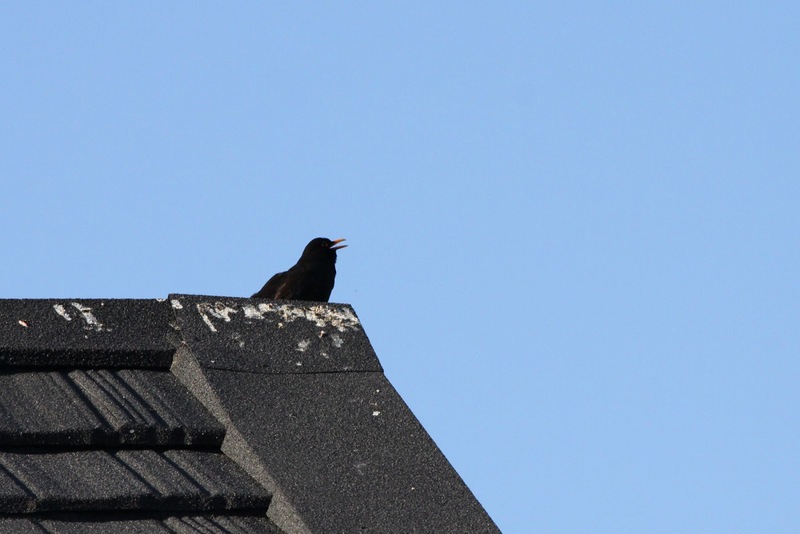 Crumbs of comfort amongst the breeding birds have included the Peregrines, whilst a singing Blackbird at the Obs is apparently part of a pair, raising hopes that the Obs garden may have its first ever bird nesting in it! Other migrants on the way through have had a bit of a sing or display to break up their journey, with Whimbrel and Red-backed Shrike getting romantic in the recent sunshine. It's never too early for a rare. Northerly winds, but still more birds. Whales prevails through gales and hails. Migrant time - on the Dot.